For dry and semi-dry food processing facilities, the Sole Clean Dry Step sanitizes any style of footwear in just 12 seconds. This new footwear hygiene technology features the automated application of a proprietary alcohol-quat chemical blend which sanitizes and then evaporates quickly post application to reduce moisture accumulation around the system. 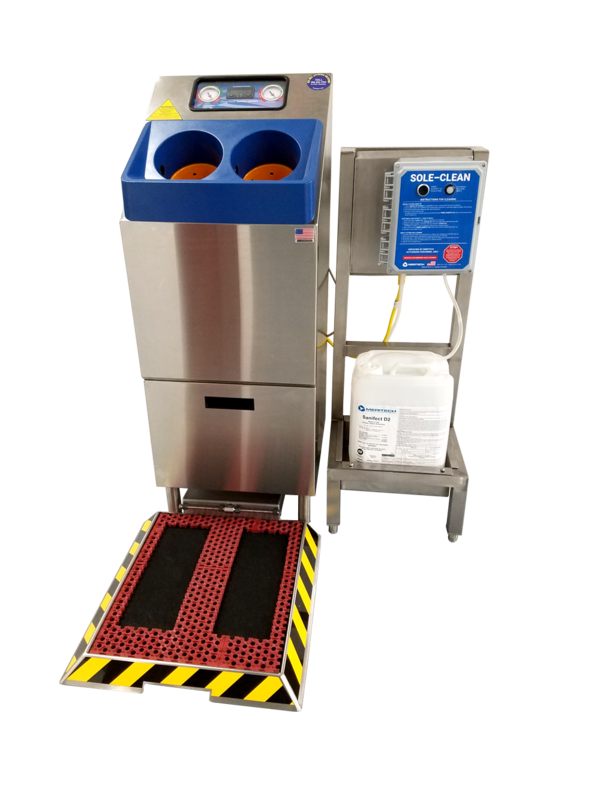 Designed to eliminate the risk of cross-contamination from footwear, when the Sole Clean Dry Step is combined with Meritech's automated handwashing systems, it provides a full employee hygiene protocol that is cGMP and compliant with all food safety standards and regulations. Automatically maintains required kill concentration of sanitizing chemical to remove 99.98% of pathogens. The Sole Clean Dry Step sanitizes any style of footwear in just 12 seconds with our fast-evaporating proprietary alcohol-quat sanitizing solution, making it ideal for dry or semi-dry production environments. When combined with Meritech's automated handwashing systems, the Sole Clean Dry Step provides a full employee hygiene protocol that is compliant with all food safety standards and regulations. Visit your market for more insight into other available Meritech solutions.